Thursday, April 4, 2019 – 4:00 p.m. – 9:00 p.m.
Friday, April 5, 2019 – 8:30 a.m.-4:30 p.m. The Volume 22 Water Law Review Symposium will take place April 4 and 5, 2019, at the University of Denver Sturm College of Law. We are dedicating this symposium to the 50th Anniversary of the 1969 Water Rights Determination and Administration Act. The symposium will be slightly different from years past. The symposium and the spring issue will work in tandem, with select topics and papers from the symposium being published in a “spring plus” issue. The theme for the symposium is the past, present, and future of the 1969 Act. The past section includes topics related to the history of the 1969 Act, the Act’s implementation, and some of the major changes and decisions that have shaped the current state of water law in Colorado. The present section focuses on current programs and major issues and questions that practitioners are grappling with. The future portion looks at issues that Colorado and the water community might encounter as we head into the next 50 years of water law. This celebration of the 1969 Act is organized and made possible by the generosity and support of the Sturm College of Law, the Colorado Supreme Court, and Colorado Bar Association CLE. Thursday, April 4 – 4:00 p.m. – 6:00 p.m. This panel leads off celebrating pioneers and key provisions of the 1969 Act. This panel continues the celebration with vignettes from water professionals who spent a career interacting with the statutory scheme. This panel will discuss the ethical considerations of dealing with water engineers, how to engineer a water case, and the ethical considerations engineers go through while handling a water case. 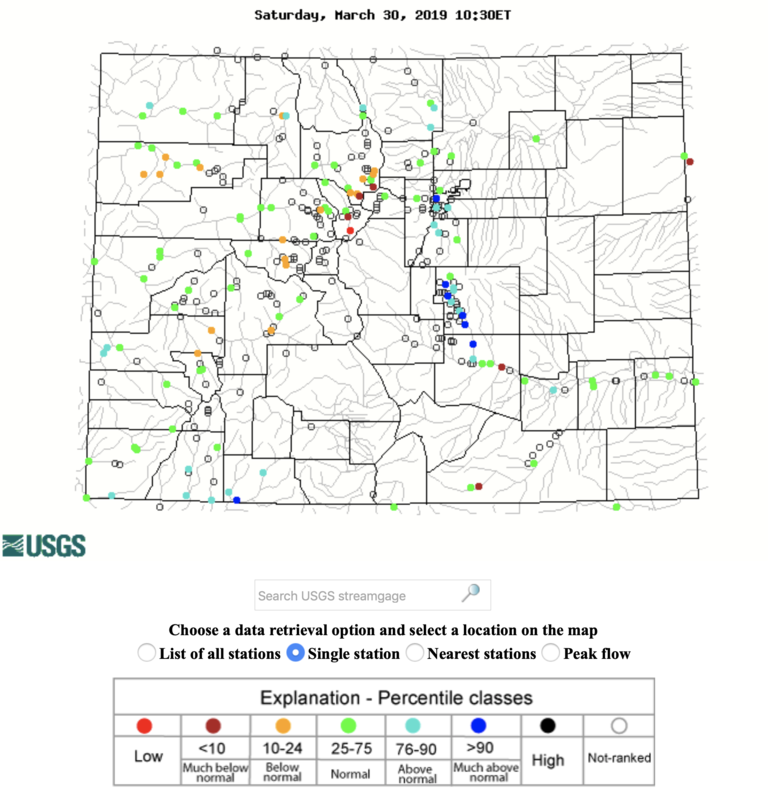 Screen shot of the USGS Water Watch streamflow map for Colorado March 30, 2019. A water gauge on the Animas River near the Powerhouse Science Center saw levels rise from 300 cubic feet per second Monday to more than 700 cfs as of Friday afternoon. Water levels came close, but not close enough, to a previous high for March 29 set in 1916 of 1,100 cfs. The water gauge near the Powerhouse has 108 years of records. But early next week, Kormos said temperatures will rise once again, and the river along with it. By late next week, the center calls for the Animas River to exceed 1,000 cfs, though Kormos noted forecasts that far out are difficult to predict. 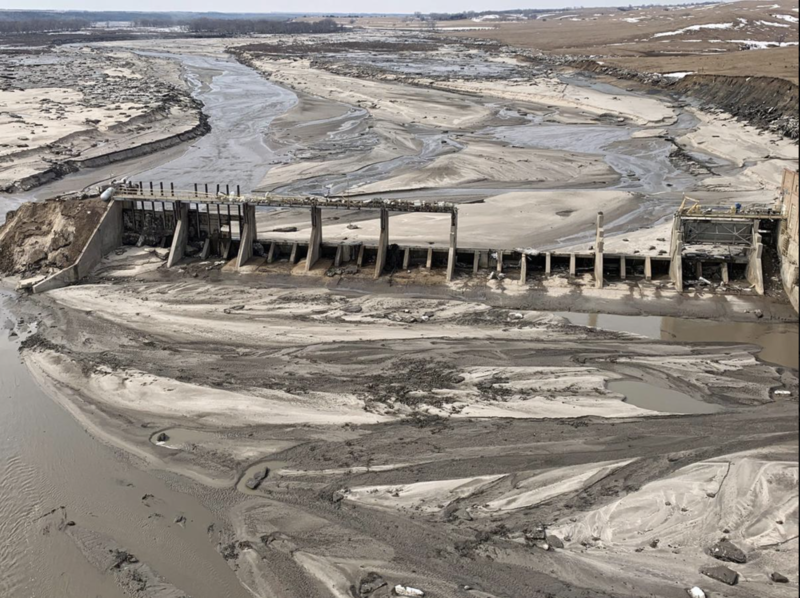 The rise in water and promise of a sustained spring runoff is a welcome sight to members of the boating community, especially after one of the lowest water years on record in 2018. Rebuffed on climate change by their Republican colleagues, Senate Democrats — including Colorado’s Michael Bennet — are launching their own committee to tackle the issue. 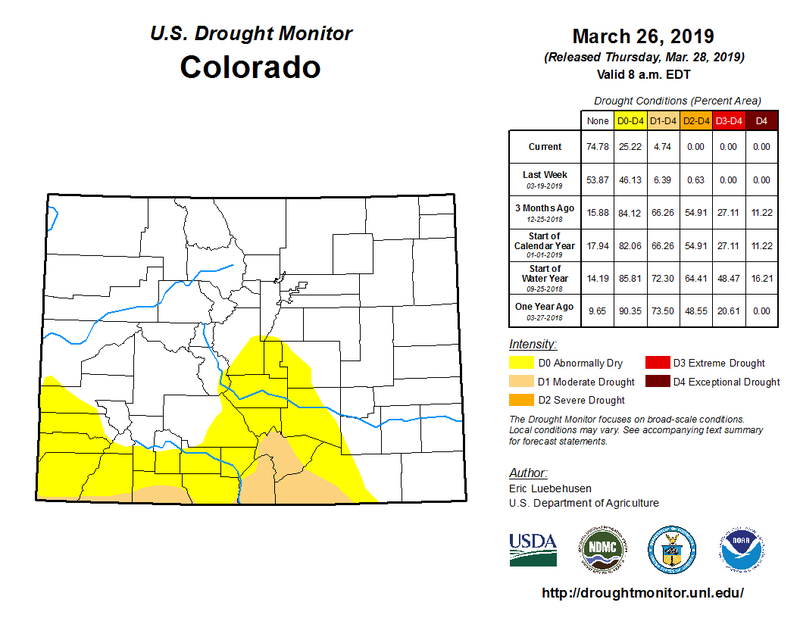 Three months after a quarter of the state had been in the worst drought conditions, only a small part of Colorado remains in even moderate drought according to the most recent report from the National Drought Mitigation Center. 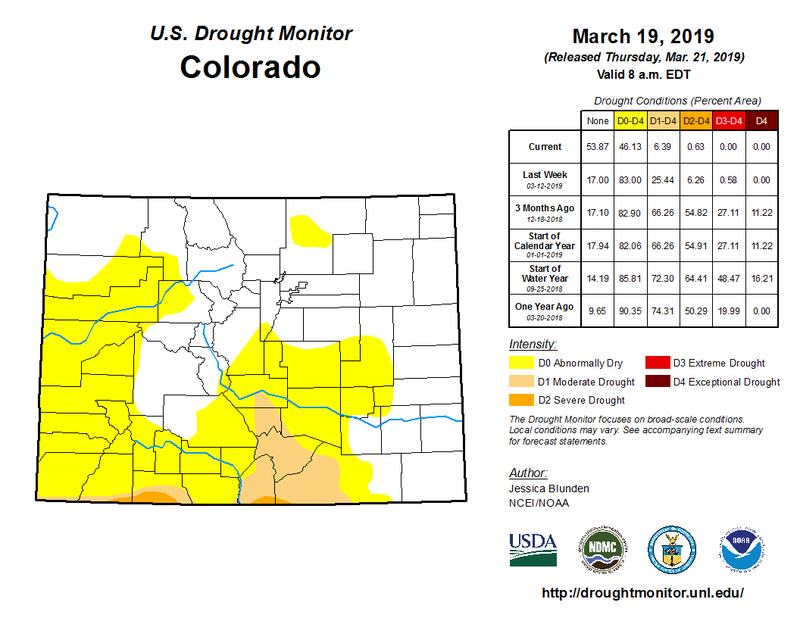 Colorado Drought Monitor March 26, 2019. 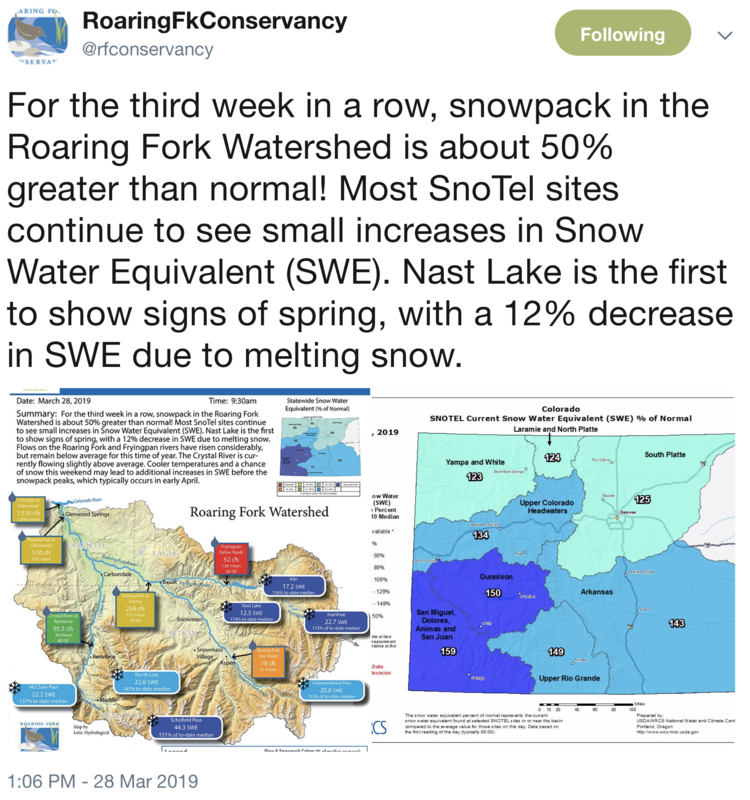 Since February, a series of storms systems have brought significant snow, particularly to southwest Colorado where extreme and exceptional drought – the two worst categories – had been entrenched for months. 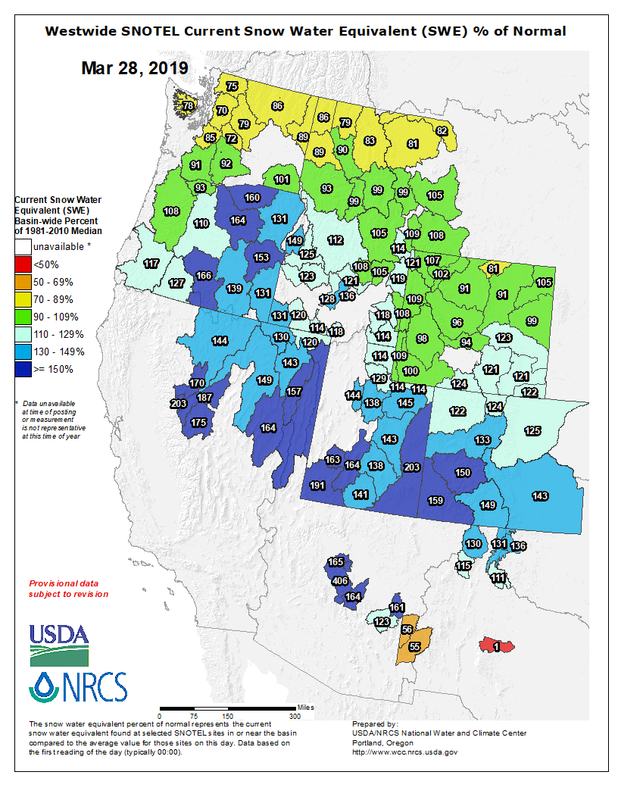 River basins in the area started the year at 70 to 80 percent of the median snow water equivalent. They now stand at 150 percent or greater, with the San Miguel, Dolores, Animas and San Juan basin at 161 percent as of March 27. Moderate drought remains across all but small portion of Costilla county. Western Huerfano and southwest Las Animas counties are also impacted by moderate drought. The southern half of Archuleta County, along with slivers of southern La Plata and Montezuma counties are also in moderate drought. Abnormally dry conditions continued to fall back across the state, now affecting only south central and southwest counties. Overall, 75 percent of Colorado is drought-free, up from 54 percent one week ago. Twenty percent is abnormally dry, down from 40 percent. Moderate drought impacts five percent of the state, down from six percent. 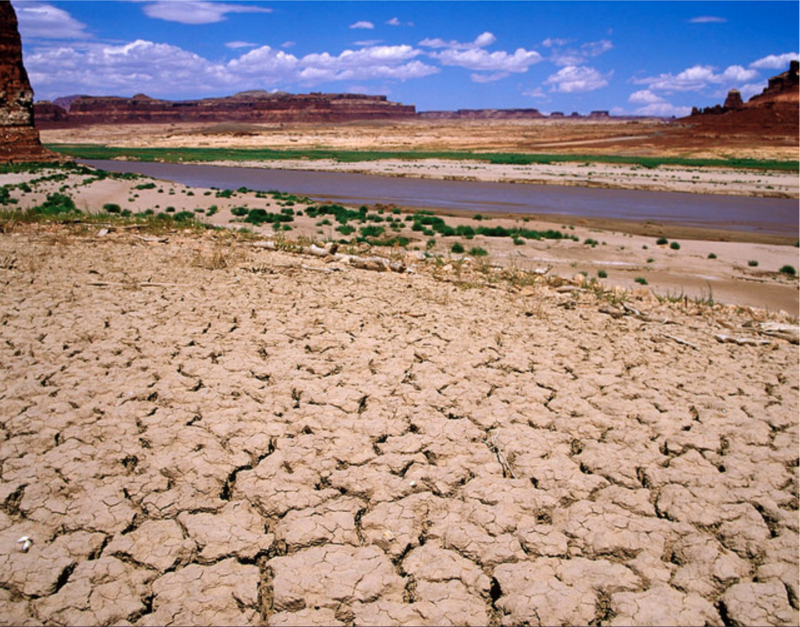 Severe drought fell to zero from one percent. Extreme and exceptional conditions exited the state earlier in the year. 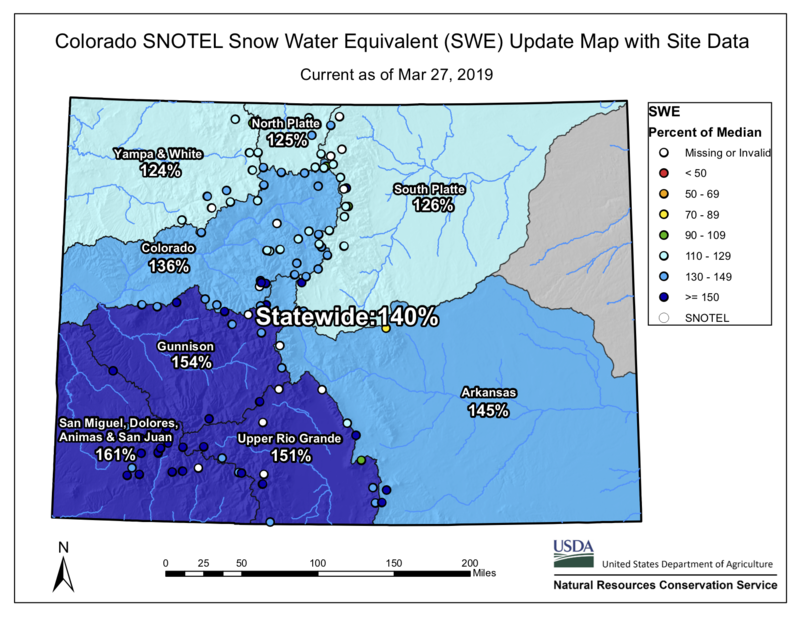 Across the state, snow water equivalent stood at 140 percent, with all basis reporting 124 of the median or greater.